Written over 60 years ago this is a classic and a deservedly popular children’s novel. Film versions have been made; both animation, and more recently a live action version. Fern lives on a farm in rural America. Shocked to hear her father plans to kill the runt of the litter of new born pigs, Fern succeeds in changing his mind. She cares for the baby pig and names him Wilbur. He is taken to live in a barn on her uncle’s farm. There he meets two chatty geese and a scheming rat called Templeton but doesn’t find a friend until, that is, he meets Charlotte the spider. 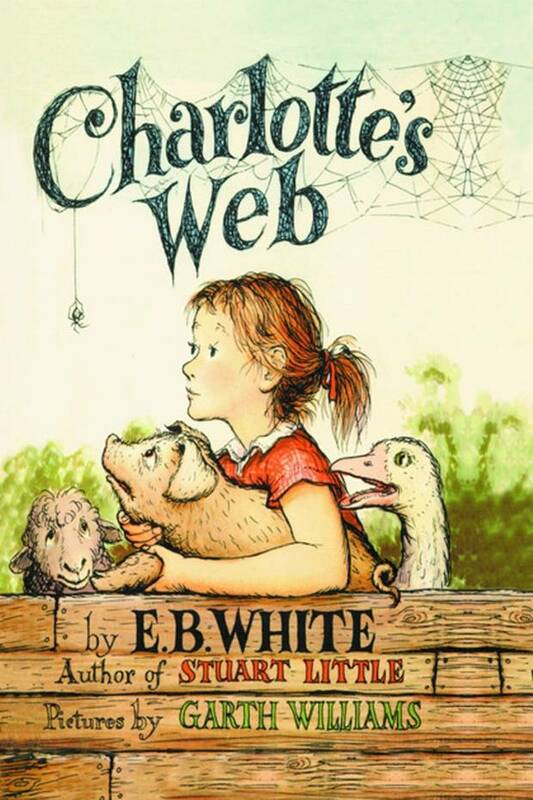 Charlotte becomes an amazingly loyal and wise friend, saving Wilbur from the slaughter house by ingeniously weaving impressive compliments into her intricate webs. In the process we find out about the real life magic created by spiders as they spin their webs. The character you both found the most interesting and why. Anything that surprised or puzzled you, in the story or the words. Fern’s feelings about Wilbur at the beginning of the story. Talk about other words Charlotte could have included in her web to impress onlookers. Use a shoebox or other small cardboard box to make a storybox. Cut down two edges of the box so that you can open one side out. Create the Zuckerman’s barn inside. You could use straw or raffia perhaps on the base or strips of paper. Add animal figures or make animals out of modelling material. Children can use their scene to retell parts of the story. Use glitter pens/paint/crayons and draw a web on dark paper or card – choose an impressive word to write in it. Make a poster to advertise Zuckerman’s famous pig. There is a lot of information about spiders in the story. Talk to children about what they have found out. Children can make a mini spider fact book. Use the links below to find out more information to add.